PART-TIME AND OPEN AND DISTANCE LEARNING PROGRAMMES NOW AVAILABLE AT CU. programmes under the Open and Distance Learning Centre. 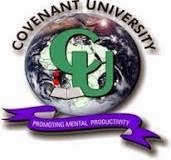 Interested applicants are therefore advised to visit the university's website (www.covenantuniversity.edu.ng) for details.